The Challenge: Play a practical joke on someone. As I was thinking about this challenge in the shower this morning the perfect idea fell from the sky, or at least from over the shower curtain. As part of Jason’s practical joke on me, he threw marshmallows over the curtain at me. I was not expecting that at all. This did inspire me to seek revenge as the motivation for the practical joke I would soon play him. As more marshmallows showed up throughout the day, I was more and more excited to get to lunch where the joke would take place. I decided to take one of the many marshmallows that Jason threw at me and I hid it at the bottom of his cup of milk. In order to get it heavy enough to keep it at the bottom of the cup I stuffed the marble from Challenge 5 in the center, along with about six pennies. Jason drank almost all of his milk until he got to the very end and saw the nasty mushy marshmallow at the bottom. He was pretty surprised and grossed out. I’m not a practical joker by nature, and I’m not especially fond of the really cruel ones. (Maybe I’m afraid of karma exacting revenge.) It took me a while to get into the spirit, but once I did, I had fun with it. I took a playful approach on my target, who happened to be some girl named Kim. We had a stale bag of jumbo marshmallows in the cupboard so I decided to put them to good use. I threw a couple into her shower this morning. I hid some in her shoes, her stocking hat, her glove, her purse, the dashboard of the car, and in each of her coat pockets. She’s been discovering marshmallows all day long.It was so cool to watch in anticipation as she found each one. And as of this writing, there are even some hiding spots she hasn’t found yet 😉 Of a better use for stale marshmallows I cannot think. This entry was posted in All Challenges, Challenges 31-40 by kim and jason. Bookmark the permalink. For me this was a breeze! For as long as I can remember I have had the ability to pull off some pretty good practical jokes. One of my favorites was the time I took my boss’s solar calculator and where the solar cells are I perfectly cut a piece of electrical tape and placed it over them. He could’t figure out why it wouldn’t work and even asked one of the “brighter” office guys and he couldn’t figure it out either. During his lunch hour Pete went out and bought a new calculator. After lunch he showed me his new calculator and then explained his old one just quit working. I looked at it and pulled off the black tape and it worked just fine! So today I wrote Pete a note saying that his brother Jim from out at the nail mill called and said he just got word from the controller that all employees at both businesses that operate forklifts have to have a refresher course by the end of February to keep their certification valid. Call brother Jim ASAP! Then I called the yard mgr. in and told him what I had just “learned”. Pete called Jim and asked about the forklift course. Needless to say Jim was confused and Pete was scratching his head looking at my note. I walked up to Pete and set in front of him this note: #39 Play a practical joke on someone. Pete then told Jim, never mind I just figured it out. Later I called the yard mgr. in and told him it was a hoax and he called me a horse’s something. I am very impressed with the use of marshmallows in the challenges. Nice! I’ve been thinking all day and I finally got something. We’re going to be watching some Sunday night TV soon and I put a layer of bubble wrap under the blanket on my husband’s chair. I’m hoping for a fun reaction! Ah bubble wrap – it too came into play in my practical joke! 🙂 I put a section of bubble wrap under my roommate’s bathroom rug. While she thought that was a weak attempt to “get her” it was a minor distraction for my main prank! When she went to get into bed, I heard the covers pulled back and then…uncontrollable laughter! You see, I had covered her two favorite stuffed animals with plastic wrap! HA! Then after she told me I “got her good” and unwrapped her friends, she layed back only to find that her pillow had that crinkly noise too – yup I shrink-wrapped her pillow too! So all in all, very fun and funny without being too mean – that’s was a LOT of fun! 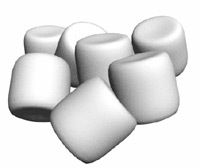 I’ll never look at marshmallows the same way again.